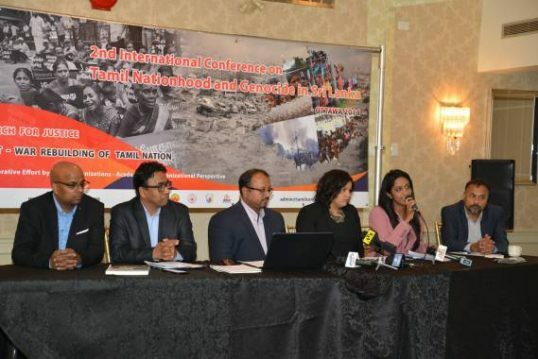 Tamil Diaspora organisations across the world will hold the Second International Tamil Conference – Ottawa 2018 in Ottawa on the Tamil Nationhood and Genocide in Sri Lanka, from May 5th – 7th, 2018. The conference will bring together academics, activists and politicians from around the world, including several international experts on post war development, genocide , land rights and collective rights. In this way, the conference aims to improve ties between research, politicians, activists and the media in pursuit of justice and rebuilding the post-war Tamil nation. Tamils have been relentlessly raising their voice for their fundamental rights in Sri Lanka for the past 60 years, but in vain. A ruthless genocidal war had been unleashed upon Tamils which culminated in May 2009 which mercilessly massacred more than 70,000 innocent Tamils. This protracted bloody war has forcibly expelled hundreds of thousands from their ancestral lands and their homes. And many have left their traditional homeland and settled in various countries, but still maintain a close connection to their homeland. Tamil diaspora has been instrumental in addressing the Eelam Tamils’ pressing and deeply painful needs. It has whole-heartedly taken an active role for the efforts taken by the United Nations Human Rights Council to bring about justice for the war crimes and atrocities against humanity committed in May 2009. For the past several decades, many conferences have been organized periodically in various countries to explain and project the just cause of the Tamils’ struggle. In this context, the international conference held in 1999 in Ottawa had a great significance. Tamil leaders such as Mr. Kumar Ponnambalam, Mr. Joseph Pararajasingham, and Mr. Taraki Sivaram who participated in that conference, had been silenced by the Sri Lankan government. 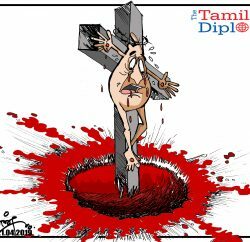 The fundamental rights of Tamils that were spearheaded through enormous sacrifices of Tamil people like them are now being tossed around for the benefit of the Sinhala chauvinistic government and some international puppeteers. The Sri Lankan government has been stalling and using dragging tactics against implementing the UN Human Rights Council resolution which calls for hybrid mechanism to investigate war crimes. Another resolution, “Sri Lanka’s Genocide Against Tamils” was passed unanimously by the Northern Provincial Council, Sri Lanka back in 2015. However, there has been no government action on either resolution. Furthermore, it has become clear that the proposals put forth in the interim report by the Constitutional Assembly Steering Committee fails to protect the rights of the Tamil Nation. Such moves portend that the final version of the proposed new constitution may not fulfill Tamils’ political, economic or cultural aspirations. In addition, as part of the structural genocide, the military occupation of Tamils’ ancestral lands is ongoing. The deliberate settlement of Sinhalese in Tamil homeland is ongoing. The building of Buddhist temples with the aim of occupying Tamils’ land is still ongoing. 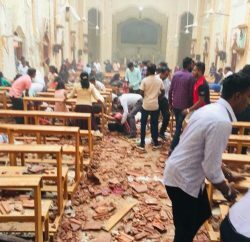 With all the indicated facts above, it has become important to reiterate once again that the Tamils in the island of Sri Lanka are a nation with their fundamental and inalienable rights, but are continuously being destroyed by the genocide against Tamils. With that in mind, the Tamil diaspora from various countries have come together to organize an International Tamil Conference in May 2018 in Ottawa, the capital city of Canada. Academics, journalists, political leaders and activists from various countries are kindly expected to participate. A meeting has been planned with Canadian Members of Parliament on the final resolution of the conference.